I’ve got an entire new house to decorate just for the everyday. I don’t think I’m going to have time to decorate for the Holidays this year. So instead of sharing a new project with you, I thought I would take us down memory lane to take a look at some of my St. Patrick's day décor from years past. *Our St. Patrick's Day scavenger hunt will be this months Facebook printable. Like us on Facebook to download your St. Patrick's Day Scavenger Hunt. If you already like us on Facebook, just click on the Free Gift Tab at the the top of our page. I knew that I wanted a red dresser for my daughters room. Luckily I was able to find a dreamy one on craigslist for only $30! Score! It was in great shape, and it only took two days of searching craigslist to find the exact dresser that I was hoping to find. I love when the stars align and I find exactly what I want at a great price. Here is a peak at what it looked like before I covered it in red. I had never actually re-done a piece of furniture before. This was quite the experience. I researched a ton of tutorials online. This was probably the most informative one that I found. It seemed simple enough just clean, sand, prime, sand, paint first coat, sand, paint second coat. It is just a very time consuming process. Luckily my parents had an old paint sprayer that I borrowed to get this project done. I do love spray painting. That’s about the only painting that I like to do. I debated going with red. Even as I was painting I questioned my color choice. Knowing me I will probably be painting this again in two years to a safer color like white or cream, but for now I love it! Here is a sneak peak at some of the pink in the room. Next week I’ll share a few more details. I’m loving how everything is coming together! Hello? Anyone still out there? Sorry we have been MIA for so long. The past 7 months(Wow! Has it really been that long?!) have been busy for all three of us. In the last 7 months we have all moved. Also, Whitney and I (Angela) had babies, and Lauren started a new job. We have had a lot going on. Like I said, I moved. Not far, only about 20 minutes from where I was living previously. We ended up buying a house that was built in 1975 and hadn’t been updated since. It needed some work. For the last few months our house has been experiencing a face lift. The house was covered in yucky old 70’s wallpaper, wood paneling, popcorn ceilings, old carpet, funky accordion doors, and the list goes on. It was just a whole lot of old. So in the last few months we have de-wallpapered, de-popcorned, and repainted the entire house, got all new doors, all new baseboards, all new carpet, new light fixtures, updates for all of the houses bathrooms, we even did a complete remodel of the master bedroom and bathroom. And even after all of that we still have plenty more to do. My head is spinning just thinking about it. Somedays I have to remind myself about how far we have come so I don’t get caught up in how much we still have to do, because I am really so happy with how our house is turning out. We closed on the house in July, but then we didn’t move into the house until September because of the work we were doing to it. So I have spent the past few months trying to get the house unpacked in between chasing my toddler and feeding my baby. I feel like it has taken forever. Finally I am to the point where I feel like we are unpacked enough that we actually live in the house. That leads me to why I have finally started blogging again… it is time to decorate the house. We may be out of boxes, but not everything is necessarily where it is supposed to be. I have a lot of projects that need to get done. Literally I have so many projects spinning around in my head that I cant seem to focus in on just one. So I have made a plan to take it room by room. I figure blogging about it all will keep me organized and on track. I thought that I would start with the room that I am having the most trouble with… my daughters nursery. The problem that I am having is with the colors I am working with. When I was originally planning the nursery it was going to have to be a shared space. We were living in a two bedroom home at the time. My son was going to have to share his room. The majority of the colors in my sons bedroom were blue and red. I thought that I would stick with those colors, but just girly it up a bit since he would be sharing it with a girl. I found some red polka dot fabric for my daughters sheets and an adorable red chair. Then when I was 37 weeks pregnant we decided to move into a home that was a little bit bigger. Now my kids each get a room of their own. I still have all of the red stuff that I bought for my son/daughters room. So now I am trying to figure out how to use all of the red stuff that I already have, but just for my daughters room. I have decided that I definitely need to incorporate some pink. Where I find myself running into trouble now is that her room is becoming too red and pink and screaming Valentines day. Not that I don’t love Valentines day, but I’m not sure that I want a room in my home dedicated to it. That is where I am currently at with my daughters nursery. Here is the overall inspiration for my daughters nursery. I love the idea of pinks walls and red floral curtains. Mostly I love that even though this room is full of red and pink it doesn’t necessarily scream valentines day. This is kind of the overall feel that I am going for. A red dresser… that is a must! I just think it is simply gorgeous! I love this solid red/pink chair next to the floral fabric. I think I’ll have a red chair next to some floral curtains. I’ll definitely be incorporating this quote in these colors. I’ll also be making some flowers for a vase. Here are a few DIY tutorials that I like. Here are some “maybe” ideas that I like, but I’ll have to wait and see how the room comes together before I incorporate any of these. Here is some cute pink and red bedding. My favorite part about this is the scalloped crib skirt. We’ll see if I get ambitious enough to try that. Here are a few other ideas that I found cute. I don’t if they will work. We will just have to wait and see. Tomorrow I will share my first completed project for the nursery. Stay tuned! And we are back.....! After a long hiatus from the blog due to babies, home moves and job changes were are ready to get back at it. 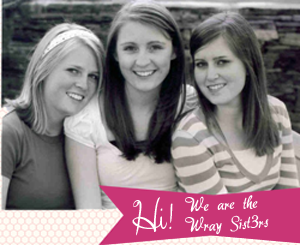 We love that we can share our talents as sisters on this blog and hope to inspire others. Today's post is in regard to the new year and making those crucial healthy eating changes. At my work I am able to talk to employees daily about the small changes they can make in their diet to see long lasting results. I would like to share with you the top 5 changes you can make in your diet to loose that weight for good. 1. Follow a 6 meals a day plan. Your hunger/satiety level should always be stable. You should never spike up really high because you have eaten too much and feel overly full. You should also never not eat enough that your hunger level spikes really low and you have low energy level. You should always feel never too hungry or too full. The helps keep your metabolism in line and burn more calories throughout the day. 2. Slow down when eating. Slow down and enjoy your food. Enjoy the company you are eating with. By slowing down you are giving time for your food to digest in your stomach and to tell your brain you are full. 3. Make fruits and vegetables a priority. Fruits and vegetables have so much water and fiber. These are two things that make you fill full and are good for your digestive system. If you are having a hard time incorporating fruits and vegetables into your diet then make a small start. Have a rule that all your snacks will only be fruits and vegetables. That way if you don't have time to integrate them into your main meals, then you have least gotten them in through your daily snacks. 4. Cut out the soda. Have you seen this Coca cola commercial yet? It baffles me. Coke, it is only 140 calories. Yeah only 140 calories of pure sugar and chemicals that you cant even pronounce. The access sugar in soda is not good for your waistline. Soda has empty calories, it does not fill you up and does not provide any essential nutrients. Avoid it if you want to keep the weight off. 5. Preparation is key. I believe the greatest way you can make eating healthier a priority is to prepare your food in advance. Think about your meals for the week on the weekend. Purchase those meal items on the weekend. Plan to add an additional 30 minutes onto your grocery shopping trip to cut up fruits and vegetables, cook chicken or fish and place in fridge in Tupperware containers. Make a large batch of brown rice on Sunday afternoon and use it throughout the week in different meals. By having things already cut up and cooked on the weekend it makes breakfast, lunch, and dinner on the weekdays a lot easier. You come home from a long day of work or being with the kids and you have all your salad fixings cut and ready to go and your chicken that just needs to be reheated on the stove. Try these simple tools to help you on the track to making eating healthier a priority in your life. This was my submission for Sunshine week over on SYTYC. Today I wanted to share the tutorial on how to create it. It is super easy! When I think of sunshine, I think of warmth. I think of the beach. I think of lazy days by the pool. Most of all I think of Summer. What could be more perfect for all of those things than a comfortable bright striped maxi dress. This dress was constructed from multiple colors of jersey fabric. The solid colors of jersey were cut into various size stripes and then sewn together to create a unique striped and colorful pattern. This is the perfect dress to celebrate sunshine and summer. It is the perfect swimsuit cover up to wear to the pool or to the beach. It is the perfect dress to wear on a summer evening walk, or just to sport around town. It is just perfect for any activity on a sunshiny day. The first thing you are going to do is create your pattern. You will want to measure from your shoulder to your feet then add 3 inches to get the exact amount of stripes you will need to cut. For example: It is 56 inches from my shoulder to my feet. I cut 59 inches worth of stripes, because once you sew the stripes together you are going to loose about 3 inches of material. I cut each cream colored stripe at 3 inches. Then I tapered the colored layers. The bottom color was 13 inches. Then the next color was 2 inches shorter than that, and and the next 2 inches shorter than that, and so on. You can see the dimensions in the image below. Once you have sewn your pattern together it is time to sew the dress. It can be completed in 6 easy steps. *I have kept the instructions pretty general. I left out specific measurements. You can decide for yourself how big you want the arm holes, and where on your waist to place the elastic, or how deep and wide of a v-neck that you want for your body. If you do want more specific measurements just send me an email and I would be happy to share what I used for my dress. As an optional step 7: You can hem all of your open edges around the arm holes, neck, and bottom of the dress. You can also leave it un hemmed since you are working with knit and it wont unravel.